Simple but good. 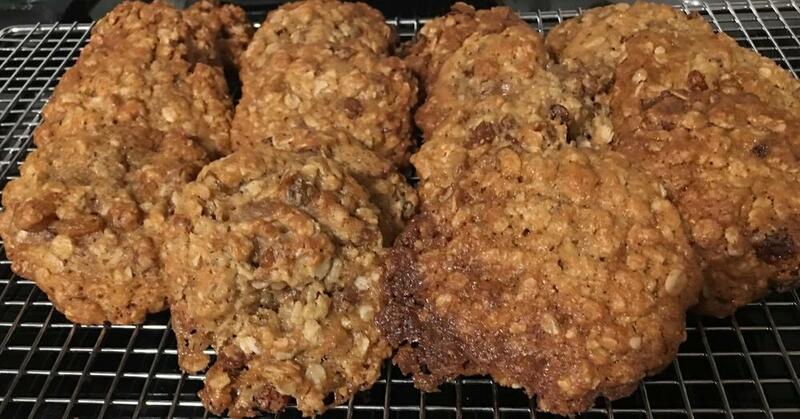 Oatmeal raisin cookies. When we did the Vanilla Crescents it was always a game of are they cool enough to handle but hot a nough to adhre sugat. A very quick and deft hand as developed early on. Otherwise ya got "paste". Even 6 year olds get it. So of all the coconut macaroons that I made over the past little while these were is the most popular. In another thread we had a brief discussion about pfeffernusse and I thought they would be an excellent offering this close to the holidays. I sampled them before they were iced and they were excellent. Once iced the texture seemed to change. They have also obviously been through the wars as the icing is no longer very attractive. I like them enough to eat them myself but I’m not prepared to send them off into the world to have aspersions cast upon them. I used this recipe. As a consequence the dough for Smitten Kitchen’s Chewy Oatmeal Raisin Cookies is chilling in the fridge. In Israel those cookies (in a more subtly spiced version) are quite popular (or once were, less so today). We call them דובשניות (lit. Little honeyed things). The coating here is always like in yours not very thick, and therefore not uniform. It gives them a snowy/icy look. IMO, the version in the recipe has an overly thick coating to it. I can assume it will also be too sugary. It was one of those days when Murphy ruled. First, when I turned the food processor on to combine the ingredients for the short bread base, nothing happened. I turned it on and off a few times. I used some words that might’ve got my mouth washed out with soap at some pointin my life before realizing that I hadn’t bothered to put a blade in there. Then when I realized that the crust was not coming together and checked the recipe, I realized I had mismeasured the flour. In an attempt to remedy that by increasing the amount of butter I managed to dump much of the mixture on the floor. Somehow at the end of it all I came up with just barely passable butter tart squares. But they have so much sugar in them that their audience will fail to find any fault with them. As befits everything else that went wrong I forgot to take a photograph before I had them packaged up. 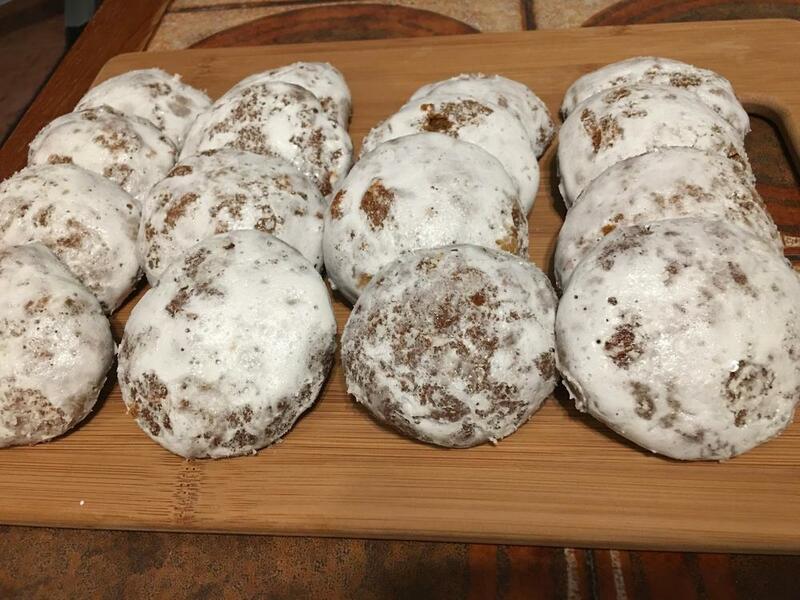 On the plus side these are the last treats I need to make this year. So the buttertart squares won best in 2018 award! Nice way to end the year. Of course, anything that sweet was bound to win with this crowd. 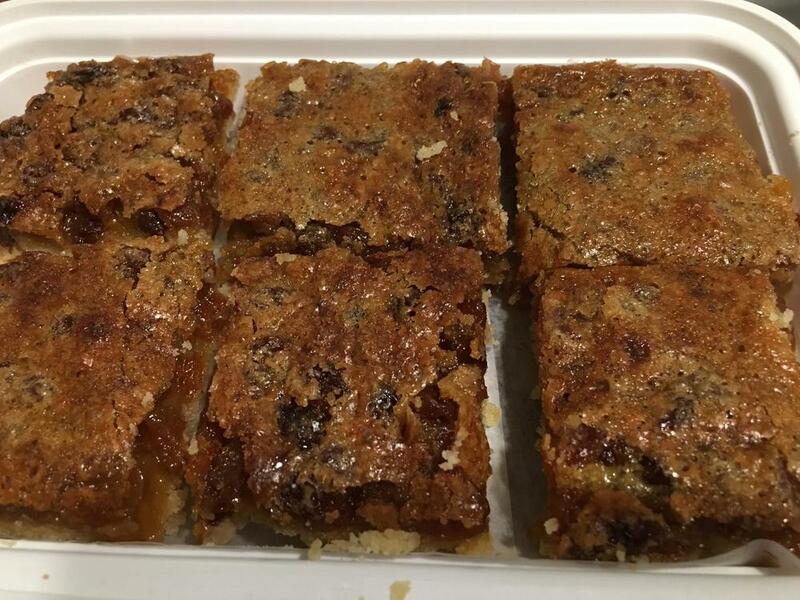 Have you previously posted a recipe for said buttertart squares? If not, would you, please? I should have given credit when I posted the photograph. My excuse is that I was looking at all kinds of recipes before I settled on this. Thanks. I remember the discussion about these before, and thinking they were similar, but for the base, to what we call chess pie. Believe I'll add chopped pecans instead of raisins, and bake them in mini muffin tins for treats, if I get to them. Banana bread in the oven now, and pecan meltaway dough chilling in the fridge. Oatmeal cookies up next. Adding candied fruit in a change from the usual, and because I had it. Another batch of cheese crisps, and that'll wind up the baking. Then it's on to candy making tomorrow. You people leave me breathless. I had to laugh, though, when I saw the date it was supposedly posted. I know some of us have been around these boards for some time, but I didn't think it was that long ago! First offering of the new year. 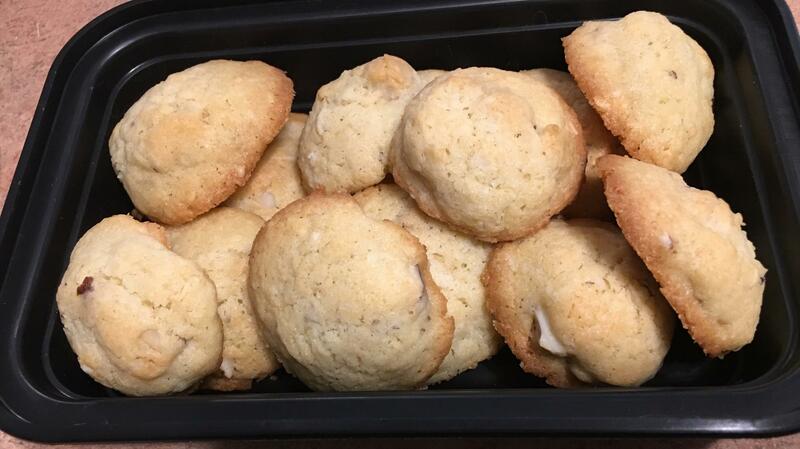 These are Brazil nut and coconut cookies. Next time I would up the coconut but all in all I’m quite pleased with these. So pleased that some of them will not be leaving the house. ...So pleased that some of them will not be leaving the house. Perhaps I should have kept them all at home. Not everyone is familiar with Brazil nuts and my suspicion is that these were not as wildly successful as other cookies for this group of people. I did get a thank you but it was more polite than enthusiastic. Indeed. I think I will reserve the Brazil nuts for personal consumption. That top one looks ready to fall. If I catch it, can I keep it? Please! You can but first you would have to sign a release with my insurance company that you would not sue. That's a small price to pay for an indulgence like that looks to be. No kidding. I'd sign about anything for one of those. Have looked up and bookmarked recipe. Friends don’t leave friends alone with these. If you do decide to bake these ignore any reference to time. After 30 minutes mine were still little more than batter. I kept adding time and adding time and I truly don’t know how long they actually took. They will be hard to over bake as they are so damn rich and fudgey. 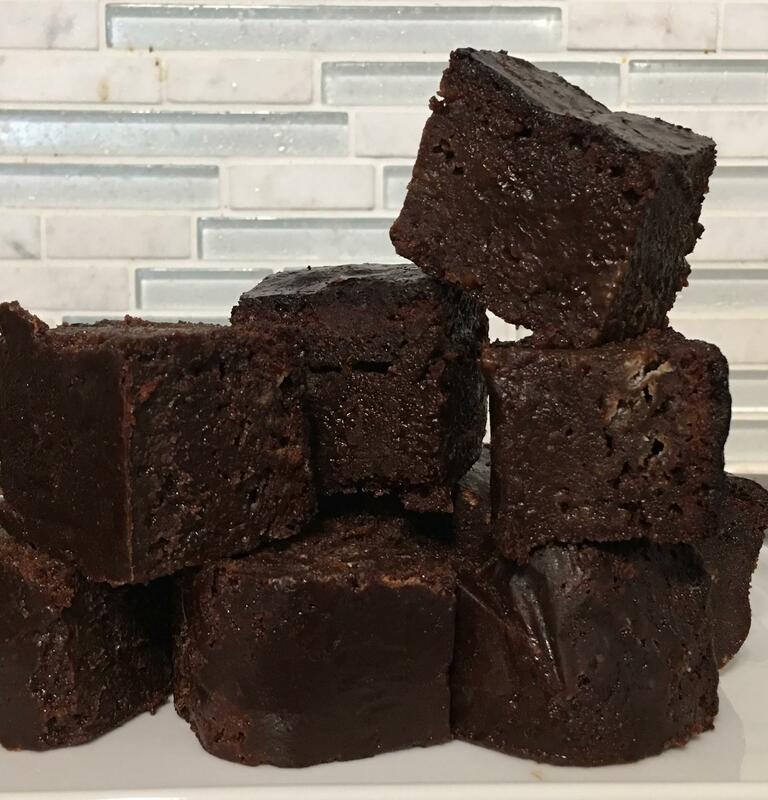 The recipe calls for a 6 in brownie pan whatever that is. I had a 7 in x 7 in stainless steel pan which I lined carefully with parchment. and the Rx is : ? ?